By the S300 you don’t need to ask yourself the question: Does it supply my speakers sufficiently? It definitely does! Extremely powerful gear putting out 2 x 100/200/300 @ 8/4/2 Ω . Built like an armoured valuables truck, it weights 25,5kg. precise), Meisei M4-24H relays, top quality speaker and input terminals, balanced XLR input, separate power transformer for non-audio circuits. 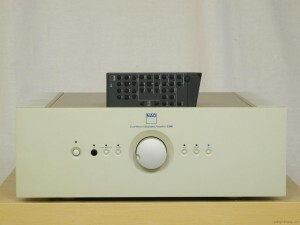 Integrated amplifiers have been an NAD focus from the very beginning: Indeed, NAD’s first international product, the Model 3020, is remembered (and widely used!) even today as being among the most acclaimed value audio designs of any era. So designing a Silver Series integrated amplifier was viewed by NAD’s engineering team as a special task. Deceptively simple on the outside, the S 300 deploys advanced engineering to perform at a level rarely if ever before reached by an integrated amplifier at this price. First, the Model S 300 produces substantial power: 100 watts per channel (both channels driven at 8 ohms; 20 Hz- 20 kHz at <0.07% THD), from circuitry that literally follows dual-mono layout from input to output. Each channel is the mirror image of the other physically and electrically, and even the power supply – that is, supplies – comprise two discrete units with two, entirely separate Holmgren-type ultra-low-hum power transformers. This approach utterly eliminates unwanted signal interactions, and equips the S 300 with internal power of unprecedented stability and freedom from hum and noise. Next, the S 300’s amplifier circuits avoid overall (“global”) negative feedback altogether, a factor today accepted as critical to achieving legitimately high-end sonic definition and refinement. Nevertheless, meticulous, inherently linear circuit design maintains the S 300’s distortion and noise performance at a solidly “modern” level – 0.07 percent THD+noise – that would be happily accepted for most conventional, feedback-based designs. Additionally, guarding this musically pure signal are sonically transparent gold-contact relays that manage all signal routing, in place of the more usual (and far less costly) electronic switches. And to eliminate digital circuits as a possible noise source, the S 300’s operational logic/control system employs yet another, fully independent power supply (with yet another, fully independent transformer). Minimal wiring, carefully chosen, top-grade circuit devices including metal-film resistors and polypropylene capacitors, and a remarkably high-precision, motorised volume-control all make the S 300’s design qualify as one of the finest-sounding amplifiers, integrated or otherwise, yet devised. In keeping with the NAD Silver Series design concept the S 300 incorporates a fully-balanced input among its five line-input positions, for full compatibility with the S 500 CD player. The Silver Series S 300 integrated amplifier is equipped with NAD-Link inter-component control, and is supplied with an NAD full-system remote handset. Control is also available via the exclusive S 70 system remote controller. Great sounding treble with a great presence, but in the bright side, little acid trebles, at least under my configuration. Wow, the mids are incredible, the voices are focus, perfectly positioned in the center of the stereo image. Perfectly controlled, natural and with a great presence. The great focus on mids can fool you about soundstage, but the 3D image is great and deep behind the vocals and perfectly pin point localization. 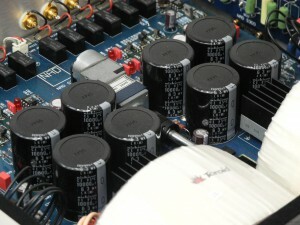 This amplifier is very warm compared to other solid state integrates. Not as sweet as tubes. great, with a huge definition, but not as Mark Levinson.